The storms battering the West Country have badly damaged the railway where it runs right by the edge of the sea at Dawlish in Devon. It's part of one of the UK's most scenic stretches of line, writes Richard Clinnick, assistant editor of Rail magazine. 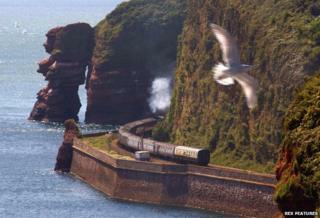 The Dawlish Sea Wall stretch of railway is one of the best-known sections of the UK rail network. Designed and built by Isambard Kingdom Brunel, it opened in 1847. It follows tidal waters for 13 miles - four miles of sea, and nine miles alongside the Rivers Exe and Teign - on the main Exeter-Plymouth line. As a Devonian who lived only metres from the wall when I was small, there is something magical about this stretch of line. But it's not just me who feels this way. It is also popular with enthusiasts, who regularly submit pictures of trains running along the coast to our magazine. There is, perhaps, no other rail location in the UK that attracts such a high level of interest. The route has featured in many adverts over the years, as well as posters and literature produced by companies such as the Great Western Railway. And they really spark the imagination, transporting people from the hustle and bustle of the city or town right to the beach. Dawlish station overlooks the beach, while Teignmouth's station is only a short walk from the sea. Millions of holidaymakers will have been enthralled at the sight, as the twin-track railway swings past Langstone Rock (west of Dawlish Warren station), and hugs the shore at Dawlish, with the English Channel stretching out as far as the eye can see. On the footpath that also forms part of the wall, people will merrily wave as the trains pass. Below, many will be basking in the sun, within feet of a fast-moving train. Brunel claimed the stretch of line would cost no more to maintain than anywhere else in the UK. But back in 2009, Network Rail told me: "Mile for mile it is the most expensive piece of railway in the UK." There are five tunnels on the section, which sees trains run along the wall until they reach Teignmouth, where the line then sweeps inland along the banks of the River Teign. And there is more to the line than the sea. The iconic red sandstone cliffs that tower over the line, the picturesque seaside town of Dawlish and the lush greenery above the tunnels all add to the magic of this stretch.